Getting and finding inspiration is extremely difficult at the best of times. Yet I have been very fortunate to work with some people who push and inspire me every time I am with them, the students. No matter what I may think what they may have in store for me, the students throw those plans out the window and make up some new plans. That was very clear when I did a drawing club with the students. They range in age from grade 3 – 5 with a large variety of skills they bring to the class. Within the class I helped them to learn how to draw three-dimensional objects but mostly how to draw in the style of popular comic strip characters. We drew Superman, Batman, Wonder Woman and even some Disney characters such as Mickey Mouse. They keep on asking me to create their character from them, then I said, “Ok, I will draw their character, however I needed their drawing first as a guide to help me with the drawing.” They said could they just tell me and I said, “No it takes time to draw these characters and I cannot do it with the hour we had.” So they agreed and created their own characters with up to 2 powers, a unique name and if they were either a hero or villain. Over the next few weeks I will be posting some of my finished characters inspired by the students’ imagination and creations. I decided to start of the creative process with my own character. I took a character I created from another class when we created a comic book with superheroes and villains. My character is a villain. Not just any villain but the leader of the Legion of Doom; Lord Ominous. I drew him as a cross between an ancient Spartan warrior and Lord Vader from Star Wars. His weapon of choice is a Scottish Claymore, not to mention a pair of Colt 45s. The students inundated me with questions about him. I showed them the comic book my other class and I created. In it, it shows that he was genetically created from DNA samples taken from the League of Justice (good guys) and the Legion of Doom (bad guys). The Legion of Doom wanted to create a new super villain leader with all their powers to lead them against the good guys. His powers included, accelerated healing, super intelligence and strength, advanced combat skills, telepathy and telekinesis. They asked why did he need weapons if he had super powers? I told them, “He’s a super villain and he does not play by the rules. He will take any advantage he can to win. Also it makes him look menacing.” Which they thought it did. 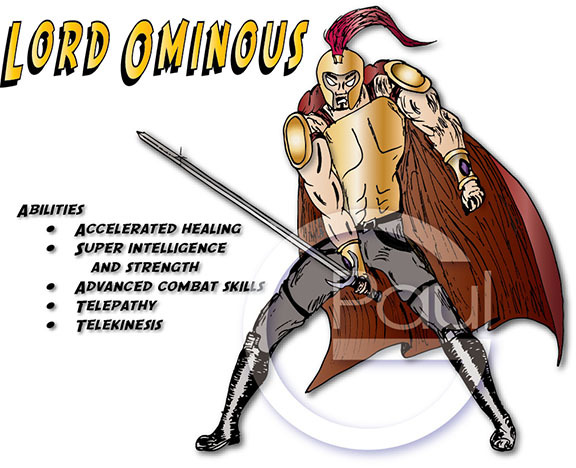 I hope you enjoy the first character from Heroes VS. Villains – Lord Ominous. Many of the students wanted to copy popular movies and comics of the time for their ideas. I have no problem with it, I feel that at least they are making the effort and hopefully it inspires some imagination. This student’s villain is obviously modeled after Deadpool, yet he did come up with unique super abilities; super speed & telekinesis. He was very active in choosing his powers and on many occasions I would hear him debating with others how his character would hold up against another characters. I took the student’s original drawing and simply drew him in an action pose and coloured him like the popular comic character. The only thing I did not draw in his character, and other characters, were the guns. Unlike swords, knives or bows, guns are very prevalent in our society and with the resent incidents of gun violence I decided to not draw him holding guns. Yet he does have them on his person, a compromise I made with the students. I showed the student his character and he was happy with it. I hope you enjoy the second character from Heroes VS. Villains – Dead Dule. Many of the students wanted to copy popular movies and comics of the time for their ideas. I have no problem with it, I feel that at least they are making the effort and hopefully it inspires some imagination. This student’s villain is obviously modeled afterGreen Lantern, yet he did come up with unique super abilities; green lantern power & animal mimicry. I took the student’s original drawing and simply drew him in an action pose and coloured him like the popular comic character. I questioned him about the swords saying, “Why does he need swords if he has a power ring and animal mimicry?” He told me that he would use the power ring to create the swords and so that is what I drew. I also made sure to give the character his unique hairstyle. I showed the student his character and he was happy with it. I hope you enjoy the third character from Heroes VS. Villains – Green Animal. Some students modeled their character after popular comics they are used to, this student had an idea of what she wanted and never wavered. She wanted something unique from the costume to the choice of weapon and powers. One thing that she insisted was that her character has red eyes. I took the student’s character and noticed that it looked like an elf from the Lord of the Rings. I asked the student if the ears of the character were pointed, she said yes. I drew her in an action stance making sure the “chain mace/flail” was in motion as if she was twirling it. I drew in the ears and coloured the eyes red, yet I wanted to add something a bit dramatic to the character. I noticed that the she drew the character with braided hair, so I drew in a braid but with encircling her. It added a more dramatic and mysterious look to the character. I showed the student his character and she was happy with a smile from ear to ear. I hope you enjoy the fourth character from Heroes VS. Villains – Mnosa. Some students modeled their character after popular comics they are used to, this student had his own idea matched with something he was use to. He wanted a character that was a bit of a cross with the Flash and Iron Man, yet he wanted a unique helmet and exoskeleton. He came to me for some ideas on the helmet and I gave a few ideas on the exoskeleton. He modeled it a bit from the storm troopers from Star Wars and football equipment. I took the students’ image and the questions he asked about the armour and took it from there. It is very similar to the storm troopers armour with a few comparisons to Ironman’s suit. He wasn’t too particular with the colour but I decided on a blue base so that it was different from Ironman. I showed the student his character and he was happy by saying that it looked cool; high praise indeed. I hope you enjoy the fifth character from Heroes VS. Villains – John 181. Some students modeled their character after popular comics they are used to; this student wanted to do something different but similar. He created a great male figure with large muscles then he wanted to give him some unique abilities: revive or accelerated healing powers and animal mimicry. I did ask him about the swords saying, “If he transforms into animals, why does he need a sword?” He say the logic and decided to remove one and he asked me to not draw my version with the swords. When I drew his character I first thought of a werewolf type character crossed with a ninja. I decided to create a character that was hairy, very similar to Sabre Tooth from the X-men. I took a few creative liberties by added the hair on the arms and legs and making his hair longer. In the end the student enjoyed my version of his villain. I hope you too enjoy the sixth character from Heroes VS. Villains – Animal King. Some students modeled their character after popular comics they are familiar with, yet this student knew what he wanted and he wanted to create something very distinctive. He researched and asked questions about which abilities he wanted for the character. What he came up with was one of the most unique characters I have ever seen. He began with the abilities of energy absorption and force field generation. From there he decided on 4 arms instead of the usual two. One eye, what looks like scales and two-fingered claws for hands. When I saw this character I was immediately impressed and asked the student about his creation. He wanted to create a bad guy monster that would absorb energy power to generate force fields. Hmm, well thought out, I told him. When I drew his character I immediately thought of the Hulk. I decided on a large bulky character but I gave him three fingers per hand, which the student said was all right instead of the two he had drawn. I also gave him green scaly skin with pointed ears and his signature one eye. I drew him in a stance to show that he was able to create force fields. His left upper arm is generating a force field. The student kept asking me for his character every day and when I finally showed him it he had a smile from ear to ear. I think he also liked the fact that the other students in the class also liked his character. You could see a hint of pride in his eye when he showed it to his friends. I hope you too enjoy the seventh character from Heroes VS. Villains – Energy Charg. Some students modeled their character after popular comics they are familiar with, yet this student knew that she wanted to create something very unique. She wanted to make a character with wings but different then what we did in the class and from what the other students did. I asked her, “What other wings could you use to fly?” and I had her look through my character guide of the Marvel universe characters. She finally decided on bat like wings, something along the lines of a vampire. I showed her a few examples and she them came up with the style she liked. In the end her character looked very much like a winged vampire, with bat wings and dark hair. I decided to draw the character in an action stance such as leaping up to take flight. I wanted to show her wings in that type of pose. I also wanted to show the long black hair she had drawn. The dress was simply modeled after the dress she had drawn. The student handed in the character about a week early; therefore I had time to draw my version in my sketchbook while the class was still underway. During the next class she asked to see something in my book and she saw the character. She asked me if this was her character but she had a smile from ear to ear when she did. When I said yes, I did not know how but the smile grew larger. She loved it and wanted it right away. I said I would give her a copy when everyone handed in their character, then I would give everyone their character and a group image at the same time. She kept asking for the copy every class after that to show everyone her character to the other students. You could see the pride in her eyes every time show showed it to her friends. I hope you too enjoy the eighth character from Heroes VS. Villains – Elelctra. Some students modeled their character after popular comics they are familiar with, yet I was not sure where this student got their idea. I asked and I cot the impression that his character was very similar to a ninja. Therefore I created a lean figure that looked stealthy ready to transform into any form. I used the same colour theme as the student for that ninja look. I showed the student his character and he was happy with it. I hope you enjoy the first hero character from Heroes VS. Villains – Shadow. Some students modeled their character after popular comics they are familiar with, yet this student knew what they wanted. This was the first archer character I had seen from any student. I was not sure if he wanted to recreate the Hawk Eye character from The Avengers but he said no he wanted to create something with a bow and arrow. I started his character similar to an assassin / Robin Hood character. I gave him a large trench coat and his clothes were coloured in an earth tone. His bow was very traditional made of wood or bone. I then finished it off with wavy hair. I showed the student his character and he was happy with it and he mentioned that it looked very similar to Robin Hood. I asked if that was ok, he said yes that was what he wanted. I hope you enjoy the second hero character from Heroes VS. Villains – Varcher. Some students modeled their character after popular comics they are familiar with, yet this student wanted to create something very unique. When I first saw this student’s character I right away thought of a hippie from the 1960’s. Overalls, long braids, sandals/flip-flops and then when you add her abilities are healing others and talking to animals, it just screams tree-hugging hippie. This is where I started when I created the character. I incorporated all of these elements but I pictured her sitting down so that she can be close to the animals. I also made sure that the braids are long enough to fall around her. I then added a cute little bunny that she is hugging; it seemed appropriate for the character. I showed the student his character and she was happy it and she also loved the addition of the bunny. I hope you enjoy the third hero character from Heroes VS. Villains – Braidie. Some students modeled their character after popular comics they are familiar with and this student may have had something specific in mind. I asked her why she drew her character this way and she said it was like she was doing gymnastics. I thought that was a great why to pose her character. I thought of what kind of pose to place her character in but I did not want it to be a standard pose. I knew that her character had the ability to stretch or elasticity therefore I wanted to show that ability. I decided to draw her character in a standing pose but stretch out her arms and hair into a shape of a heart. I showed the student his character and she was happy it but she had a question. She asked, “Why is her hair in hearts too?” I said because her entire body, including her hair, has the ability to stretch or has elasticity too. She loved the thought of it and wanted to picture right when I showed it to her. I hope you enjoy the fourth hero character from Heroes VS. Villains – Super Coco. Some students modeled their character after popular comics they are familiar with and this student may have had something specific in mind. He asked me to help him create armour that was similar to the type that the clone troopers and the storm troopers from Star Wars wear. Then I saw his characters abilities I knew he was going for a cross between Ironman and a Jedi. After he gave me his character I thought of a Jedi like Obi Wan and his battle armour yet I want to show the character in a different light. I drew the character in an action pose like jumping or leaping. I then too my cue from the armour he drew to recreate it on the character. I tried as well to model the hair and face to the student’s for a little extra touch. I showed the student his character and he was happy with it especially the pose and that it looked a bit like him. I hope you enjoy the fifth hero character from Heroes VS. Villains –Lord Awesomeness. Some students modeled their character after popular comics they are familiar with and this student had one character in mind from the start. When I first saw the character I immediately thought of the character Venom from Spiderman. I asked him if that is who he modeled the character after and he said a definite yes. Therefore with the image of Venom in mind I began by trying to come up with a stance that was different from most of the characters that I drew. The first thing I wanted to draw was to have him in a pose that was hunched over in an attach position. The student drew the character with shoes but I decided to draw it with dragon/dinosaur feet, complete with claws. The same for the hands but I also made it very muscular like the character Venom, as well as the face and eyes, similar to the student’s drawing. I showed the student my version of his character and he was ecstatic. He said this is exactly what he envisioned. Some of the other students said that it looked too scary to be a hero but I reminded them that looks could be misleading. I reminded them of Beauty and the Beast. I asked them who was the hero in that story? They all agreed it was the beast and that the student more pleased with his character. 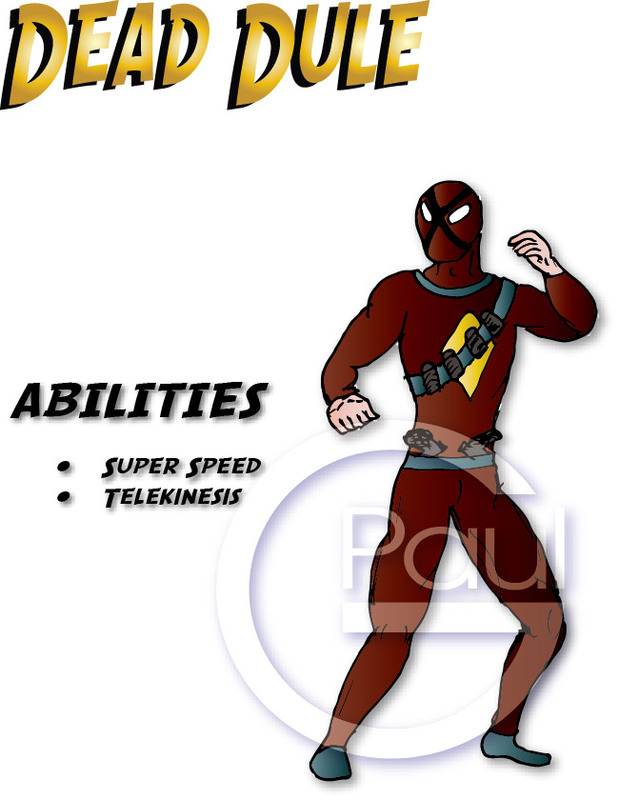 I hope you enjoy the sixth hero character from Heroes VS. Villains – Venomous Shadow. Some students modeled their character after popular comics they are familiar with but I was not sure what this student had in mind. I think that he wanted a simple character with the abilities of invisibility and super speed. He wanted to show that his character was invisible so he drew his character with no torso and only the extremities. I found this take on drawing an invisible character very interesting and creative. I decided to draw his character with a simple body type in a running action pose. Then when I coloured it I increased his transparency except for the eyes, sword and the logo. I then added the background to help give the illusion of invisibility. I showed the student his character and he was happy it and he liked the transparency. I hope you enjoy the seventh hero character from Heroes VS. Villains – Invisible Man. Some students modeled their character after popular comics they are familiar with, yet this student wanted to create something very unique. She asked me about creating wings but not bat wings like another student but one with feathers. The student also wanted to create a character with another student so that they would be twins that would look like each other but have some different abilities. I thought this was very imaginative and showed them how to draw wings and showed them the character Archangel from X-men. Those where the wings she and her friend was looking for therefore I drew her character with this character in mind. I started with the body pose and then I drew in the wings. I showed the student my version of her character and she was ecstatic. She loved the pose and the wings. I hope you to will enjoy the eighth hero character from Heroes VS. Villains – Korra. Some students modeled their character after popular comics they are familiar with, yet this student wanted to create something very unique. The student also wanted to create a character with another student so that they would be twins. They would look like each other but have some different abilities. I liked the idea and encouraged the two with any help they needed or asked for. Her “Twin” is the previous hero character Korra. They would both have wings with feathers yet the hair would be different and they would have the same ability of telekinesis, however Korra would control water and Lorra will control fire. I thought this was very imaginative and showed them how to draw wings and showed them the character Archangel from X-men. Those where the wings she and her friend were looking for therefore I drew her character with this character in mind. I started with the same body pose as the twin and then I drew in the wings. Yet unlike her twin’s wings stance of them coming down as if wrapping around her body, I drew this character’s wings up to show them for all to see. I showed the student my version of her character and she was ecstatic. She loved the pose and the wings yet she wanted it to look almost identical to her friend’s character. I said that you two are twins but there, like your abilities, slight differences. Then I reminded them of a couple of twins in the school they knew and they both have slight differences too. After I said this she felt better and was showing everyone her character proudly. I hope you to will enjoy the ninth hero character from Heroes VS. Villains – Lorra. At the end of the club I gave them a certificate with my version of their character on it. Yet I also wanted to give them something else. I decided to create a final portrait with all the characters in it for everyone in the club. The original was in black and white, in case they wanted to color it themselves, but mostly I did not have the time to create a colour version; until now. I hope you to will enjoy the final portrait/collection of all the characters from Heroes VS. Villains.